GemSeal Rapid Set is a polymer modified additive for use in both refined tar and asphalt emulsions pavement sealers. 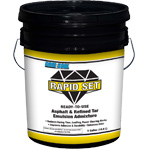 Rapid Set reduces dry time, improves sealer adhesion and increases durability. Rapid Set greatly increases tensile strength and durability, substantially reduces drying time and power steering marks in the finished coating. GemSeal Ultra 3 is an additive that substantially improves adhesion and durability of refined tar emulsion sealants. 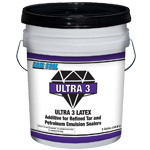 Ultra 3 is an excellent latex additive that increases viscocity and suspends sand during application. *Ultra should be used in all formulations containing sand to prevent aggregate rollout and increases life of film. *Ultra latex additive is milky blue latex containing proprietary surfactants and modifiers with a minimum solids content of 40%. TarPrime Oil Spot Primer is a formulation of acrylic polymers that allows the pavement coatings to bond effectively and dry quickly. A unique ready to use, job-proven primer. Prevents oil and grease spots from “bleeding” through fresh blacktop sealer. CrackFlex Pro-S is a hot pour crack and joint sealant formulated with select asphalt resins, synthetic polymeric rubber and plasticizers for use under extreme conditions. Designed specifically for asphalt and concrete pavements experiencing a high degree of pedestrian foot traffic and vehicle traffic. Exceptional bonding qualities and maximum flexibility. May be used in either oil-jacketed or directfire melters.